Boy, am I glad to be back! Yes it was wonderful to see my sister get married, but man, what a week. Lot’s, and lots of running around. The weather was just beautiful. Crisp fresh air, nice afternoons and chilly nights. It was great to take a break from the usual and visit our local food spots . I sure do miss that food, got a few dishes I wanna try to recreate here. Maybe I’ll have my sister bring me some yummy treats if she comes for Thanksgiving. So now that I’m back, let me share with you what I have been saving. I made these tacos on a whim two Saturdays ago. And, I’ve been thinking about these tacos since I made them. They were so delicious, filling, and refreshing. I can become a vegetarian with meals like this. Now, what’s Yuca (you-ca) ??? It’s a white starchy root vegetable, native to South America and the Caribbean. 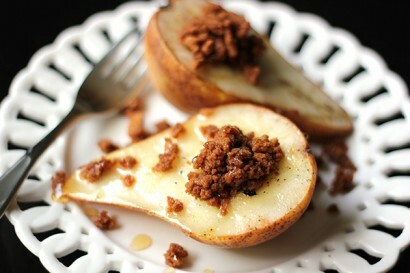 It’s fibrous, yet tender, kind of like a potato. Although when you peel them it’s a tough root, sort of like peeling a pumpkin. Now once you boil them, they become soft. If you mash and add some butter it’s like fibrous mashed potatoes. I promise you that you may be able to pass them off for potatoes, my friend used to do that with her daughter when she was small. She would only eat mashed potatoes and chicken. One time, she was at my house and all I had was yuca. We boiled it, added butter and served it to her daughter. Convinced her it was potatoes, she was 5 at the time. Although, she kept asking if she was eating potatoes, but after a few minutes of convincing she bought it . Since I’m hispanic, I’ve been eating yuca since I was small. As much as I love it just boiled in some salt water, and served next to a fried egg. Combining yuca with pumpkin and mexican spices was just divine. Seriously, I you get two textures that work well together. Darn good tacos . Let me show you how to peel that yuca. You need a sharp small knife, you can use a large chopping knife but you have to be very careful. You will be peeling the yuca towards you, so any mishap will slice off a finger. You first need to chop off the ends of the yuca, usually just an inch or two. Once that’s chopped, grab the yuca firmly at the end with one hand as it rests on the chopping board. Using the knife, hold the yuca as you place one swift chop on the center of the yuca. This should chop the yuca root in half. If it’s still slightly together, to avoid using the knife, just hold the yuca with both hands and hit it against your knee. Now, that it’s in half, using your knife you will peel it. Hold the yuca with one hand and slowly slide the knife against the meat of the yuca and the skin. remove a few strips of the skin, until you can place the knife against the meat and just push the skin off. The easy thing about yuca is that you once you remove a few strips of the skin, it is removed easily as you push against it. As you see in the photo above, I’ve pushed back some of the skin. The skin is 3 layers: Rough brown waxed bark like skin, then comes pink skin (small piece on the yuca seen here), and then a layer of white skin. You have peeled it correctly when you see the white layer of skin on the peel. If you see any pink after it’s peeled, run the knife across it to remove. Now some parts of the yuca maybe “bad”. These parts will usually look gray in color and you would see a lot “veins” (see 2 veins in the picture) grouped together. Only when it’s a bunch of “veins” and the meat is gray then it’s best to cut that piece off the yuca. If you cook it, it will be bitter. Once it’s all peeled, half the yuca once more with the knife down the stem. And cut into small pieces. Set a pot to boil, and boil the yuca until tender to the pierce of a fork. Remove the water when the yuca is cooked (or it will make the yuca mushy) and set aside. Once it’s cool, you need to search for the “stems” in the cubes of yuca. The stem will be a “yellow” color and stick like. See picture below, you can easily remove with your hand. I know it’s a lot of work, but this is what you are chopping for. Trust me it’s worth the fresh ingredients. Now cut & peel the pumpkin. See instructions here. Once it’s peeled, boil it until tender when pierced with a fork. Strain the water. Drain the can of beans and rinse the beans a few times. Until the thick juice of the bean is removed. Place in a large bowl. Drain the corn, place in the bowl with the beans. Add 2 tbs of the vinegar from the pickled jalapeños. Chop tomatoes and add to the bowl. You may add some sliced jalapeños if you want more spice. Grab a large skillet and add coat with olive oil. Heat the skillet on medium-high heat. Add equal parts of yuca and pumpkin, add a few dashes of the paprika and cayenne. Toss till coated. Warm the tortillas in the microwave. Place them in a microwavable plate covered with paper towels. 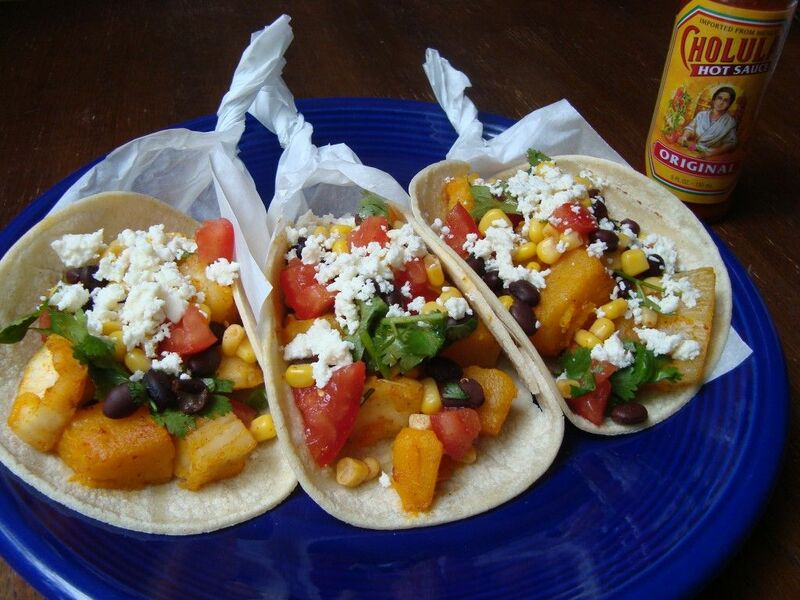 Place a spoon of the pumpkin & yuca mixture in the center of each tortilla. Add some of the corn & bean salsa. Freshly chopped cilantro and crumble some of the queso fresco. As I baked my way through Christmas this year, my usual. 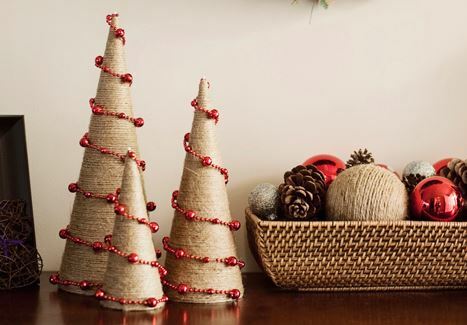 I wanted to do a little Christmas craft I had pinned the Twine Christmas Trees from Thrifty Crafter. Did you read my secret? Did you catch my new addiction?…… Pinned. Set up in an area that you can work comfortably, a table is best. I attempted to do the last large cone on my couch using a TV tray as my table. Bad idea, I got burned. So please stick to a well lit area and a large table. Prepare your area: have available glue sticks at hand, a piece of cardboard to place your hot glue on, and the roll of twine of to the side and partially unrolled. WHAT! You started from the bottom?! Yes, I started the way I start my Christmas Trees, bottom up. The original crafter started from the top. I found the bottom to be easier, as it allowed me to turn and wrap the tree. when you get back around to the starting point, try to curve the twine around it then go over it. As the glue cools but is still workable, pass your finger through it to remove any excess glue. Some of the glue will bulge in between the ribbons of twine, you need to flatten this by passing your finger through it. The glue will roll off and you’ll have a little pile of glue on your desk at the end of the craft. I sure did 🙂 . After you get over the starting point, it’s just a matter of glue and wrap. The easiest way is to have the twine rolled the way it’s curving. It will make the wrapping easier, so you follow the natural curve and it doesn’t get tide up. Once you get in the groove it gets easier. Now how do you finish the top??? I froze for a second when I got there the first time. OH MY GOD, what do I do? Okay so add glue all over the top, wrap the twine around the top once, then making sure you have loose twine ready, circle the twine freely over the top. Cut the end, leaving a little bit extra to tuck in. Once it’s all circled, push the twine in to the top and blow so the glue dries. Now the monster tall one, isn’t that scary at all. I really was a little nervous at starting it, I didn’t know if I had enough twine. But it turned out I did 🙂 and so will you. Just start wrapping it the same way you did with the smaller ones. It will take a while but before you know it, you’ll be at the top. Yeah, that’s right! Look at those babies, aren’t they gorgeous? As much as I enjoyed the Beets on Gorgonzola Toast these sugar pies take the cake. While I was making the beets I remembered I had strawberries, my taste buds starting talking. Strawberries, gorgonzola, cream, and baguette, whats not to love. These are perfect for the season, perfect for mother’s day, perfect for movie night, just plain perfect. The strawberries are best at room temperature, nice and fresh. They bring spring/summer into your mouth! The touch of honey and tang of balsamic vinegar are amazeballs. Your mouth will feel like it made out with honeybee, who’s dad is a cow, that just spent the night at the strawberry bar. Make the gorgonzola cream (takes just a few minutes). Slice the baguette into diagonal slices, about 1 inch thick. Brush with some olive oil and toast on a skillet on medium-high heat. You want the slices to toast rather quickly, just give them a nice light brown tan. Lather on some of the gorgonzola cream, top with a few slices of strawberries, drizzle honey and a splash of balsamic vinegar when ready to eat! Oh Happy, Happy, Happy Fall! Autumn, I’m in love with you. The last 3 months of the year are my ultimate favorites. Each leading up to the creme de la creme, the honey to my life, the kick in my step… CHRISTMAS! Just the thought brings a twinkle to my eye. Okay, so first we get to savor all the sweetness of fall. 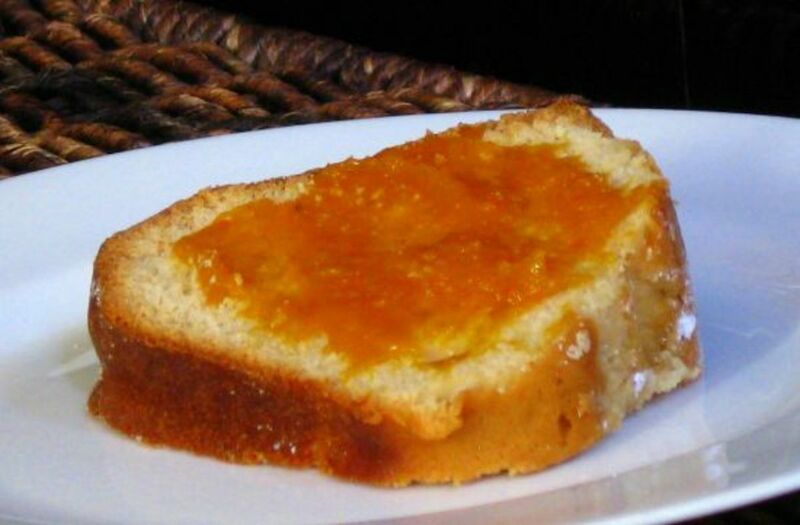 With this recipe you can have fall as fast as you can toast bread. Plus, you most likely have all the ingredients sitting in your fridge and pantry. Did you just realize that you can now have fall all year long? For breakfast, a quick dinner, afternoon snack! Yes, Please! Yup, that sounds more like it. And that crazy lady was OH A ROLL, last weekend. Homegirl knew what she was doing. I made 3 great recipes, visited my first craft show, and we also made it to the Botanical Gardens “Chinese Lantern” Festival. Right before we left we chowed down to the sandwiches of sandwiches. I was able to marry the Cherry & Tomato Jam, and Puerco Asado! It was EPIC. You will not share this sandwich, and it will be difficult not to each more than one. 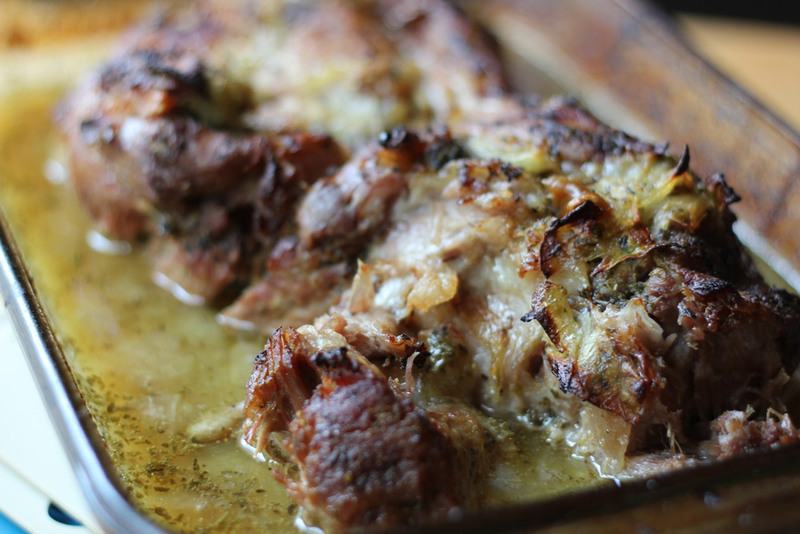 This Puerco Asado Melt is a party in your mouth! You’ve got the acidity from the Mojo of the Pork, the sweet and spiciness from the jam, and the manchego cheese gives it a bit of a sweetness. Now that I’ve enticed you with this sandwich, let me show you the rest of the weekend. The craft show was held at an old Police station!! How cool is that. I met the talented Beth from Parsimonia visit her blog . Loved meeting her and seeing her new mobile vintage shop. She has great style and was so sweet!! OH, and she also has an Etsy shop, check it out! I wanted to walk out with a bunch of stuff. And to my luck, darling Beth had an owl sugar bowl that I spotted the second I walked in. These owls I tell ya, they love me. He was missing the spoon but it didn’t matter, he was too cute to leave behind. I’m not sure what I’m going to use him for, probably just sit him up pretty on a shelve. I also walked out with cute little bows for my niece. It took me 10 minutes to decide, there were so many adorable ones. It’s a little shop called Just Live, she’s on Etsy too. Visit her shop here . I kept admiring the headbands she had. I almost walked away with one but just don’t feel like I can pull them off. I gotta build that confidence, be hip! Oh!! And inside I saw this cute booth with handmade little creatures of clay. SO FREAKING CUTE!!! Look at the gnomes, I need a gnome in my life. Ready for a slice of heaven. Butter a large grilling pan or sauce pan. Place some of the Spicy Cherry & Tomato Jam on a slice of bread. Place the slice on the pan to “grill” as if you were going to make a grilled cheese sandwich. Top the jammed sliced with some of the shredded Puerco Asado. Then add a few thin slices of Manchego cheese. Top with another slice of bread, and begin to press down with your spatula. If needed add more butter to the pan. You want a nice toast on the bread. Carefully flip the sandwich over. Toast the other side. If pieces of pork fall out just pop them back in. Once toasted (should be about 2 minutes on each side) remove, slice in half and enjoy. Oh the things I do to my poor dogs. Yes, that’s a DIY mad hatter hat, no it’s not for Diva. I just wanted a cute pic to send to you, my friends, in instagram when I completed this surprise. About 2 weeks ago, we did a bridal shower & bachelorette weekend for my little sister. I’ve been meaning to show you all how to make this, but life’s gotten in the way. After the crazy busy weekend with my little sister, I spent this past weekend apartment shopping and relaxing. Trying to gather my energy up for the next few, even busier, weeks ahead of me. Got a trip next weekend, wedding task completion during that following week, wedding that weekend, move the following weekend, then thanksgiving. Did you pick up what I was putting down? Are you tired yet? Okay so back to the hat. When we started planning for my sister, my oldest sister said she wanted to make a mad hatter for her. I thought it was a great idea, and searched the internet for templates. I hit the jackpot when I came across Hungry Panda Clothing site. This was it, it was on, where’s that hot glue gun? Hope you all excuse the photos. After I made the hat, I took pics with boxes in the background. Then the weekend came and went, my sister took it back home with her, and it dawned on me! Wait, how could I not have taken a cool picture styled as a tea party. So I asked my sister to take a cool photo outside, above is what I received. I love her dearly, I want that mason jar with the handle. Cut out each piece from the pattern and cut 2 of piece “C” (one with the center cut out as in the pattern), 1 of piece “A”, and 1 of piece “B”. I changed a bit the pattern of the hat, I decided that my cardboard was not sturdy, so that’s why I printed 2 of “C”. If you cardboard is semi thick then just use one. To make it easier, I just cut the tear drop shapes first and then folded the “teeth” and tab for piece “B”. Mold your cardboard before gluing the fabric. Piece “B” should be round, this is the top of the hat. Piece “C” just mold the tip curving it up. The cereal box I used was not firm, so I was able to mold it without lightly wetting the cardboard, as Hungry Panda suggested. If you do wet the cardboard to make the molding easier, make sure it dries before applying the fabric. Using the same patterns for the cardboard pieces, cut the fabric to those shapes. Note: Do not cut the “teeth” in the fabric, just the shapes. I left a little bit of fabric outside of the pattern so I could cut and shape as needed. I didn’t want to risk cutting to the exact size of the pattern, since this would leave some cardboard noticeable. Okay, so once you have all your fabric cut, place the molded cardboard in an opened box or go outdoors. Spray the cardboard (work with one piece at a time) with the adhesive spray. I coated the cardboard and then quickly placed the coordinating fabric on the glue. Shape the fabric to the cardboard and let dry before continuing to make the hat. Should dry within a few minutes. Alright time to hot glue this ____. NOTE: The tip of the hot glue gun will get hot, do not touch it. Hot glue, is well HOT when it first comes out! So be careful. First glue together piece “B”, then glue this to piece “A”. If you find that this piece is giving you a hard time, try cutting out a smaller tear drop shape without the teeth. Once those two pieces are together, glue them to piece “C” with the “teeth”. Use the opening of piece “C” to push the pieces together to assure they are glued. Finally, glue the second piece “C” the one without the teeth to the bottom of the hat, covering the opening. You should now have a hat glued together, now comes the fun decorating part. Start with the trim. Using the ribbon, begin to cover the trim from the top. You should start at the back of the base of what was piece “C”. (see picture below from Hungry Panda Site) Use small line of hot glue to glue your ribbon. You will need to fold the ribbon with your fingers and fill in where more glue is needed. Don’t worry if some extra glue is visible. Sorry I was making the hat alone and hot glue sure dries quickly so I wasn’t able to take my own photos. Once you have the trim done, you can decorate to your liking. I used large feathers, a crystal button (to symbolize the ring) and a tag for the date. To create the tag cut out a rectangle from the manila folder. Cut the edges of the rectangle semi round. Now with the sharpie, write the date or numbers you’d like. I added this touch to incorporate her wedding date on the hat and really make this a mad hatter hat. Now to decorate, I glued the feathers first, then the mini bow I made from another ribbon, date tag, and finally the crystal button. Wow, this was a mouth full. How do you wear it you say?? Easy, remember those bobby pins, hot glue some to the bottom of the hat. TADA. All done! 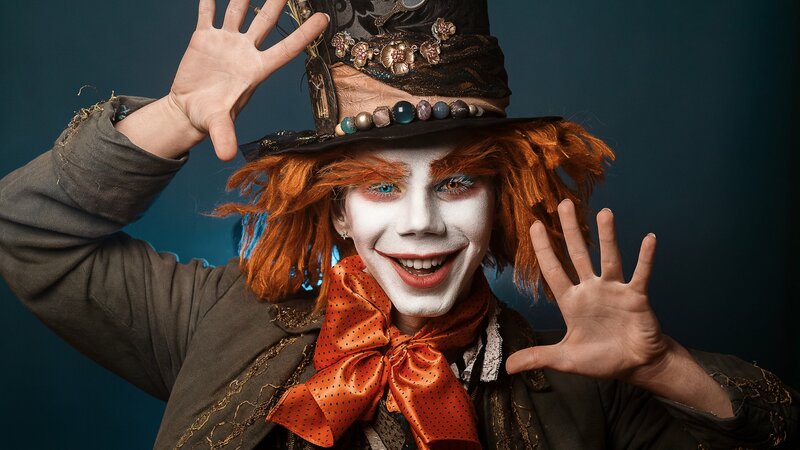 Go rock that mad hatter hat. Hi Y’all!!! I’ve been given the opportunity to guest post in someone’s blog. I KNOW!! Can you believe it I’m so happy. It all started with twitter, I LOVE TWITTER! There I met Krista from Budget Gourmet Mom. She is a mom of 4 boys and makes delicious budget friendly meals! Look at that photo! Seriously, just look….drool. Okay I’ll stop. So we’ve been grilling every weekend! yes, almost every weekend. This is honestly the first time we’ve ever owned a grill. It’s our new joy, and it gives a chance for the man to get his cooking on. Last week Alex mentioned he wanted to try smoking a rack of baby backs, which I quickly agreed. I love me some yummy fall of the bone baby back ribs. When Saturday came, I knew ribs were in our future. My brain started thinking of what to make for dessert. After a run walk in the park, I drove over Trader Joe’s. I still wasn’t sure what I was going to make but I knew it had to have fruit in it, then the show Extra Virgin came flashing in my head. They made grilled peaches with amaretto cookie crumble. Peaches aren’t in season yet, bummer, but I spotted a row of golden pears. I grabbed two and went on my way to the cookie aisle. I hastily passed the chocolate section. “Don’t get stuck in the trap, you are not here for chocolate! Cookies woman, cookies!! !” I repeated to myself. I must have walked that aisle about 4 times, and if you know how intimate Trader Joe’s is, I was imagining someone watching me and my crazy self. It was a toss up between the bistro cookies (biscoff type) or ginger snaps, I held both in my hands and the bistro cookies won. We later purchased our ribs from a local butcher shop and headed home to cook. The minute I got a chance, I broke open the package of cookies. The first cookie popped out at me, it was cracked totally meant to be eaten. I was so happy I got these instead of the ginger snaps. As I munched on a few cookies, I was thinking of my inspiration and how they had mixed the amaretto cookies with amaretto. I had no amaretto at hand, but spotted a bottle of Grand Marnier. Perfect. This is by far the easiest dessert I’ve ever made, it’s simple & fancy. It’s nice and refreshing to have with any cuisine. It’s like drinking wine while eating pizza, fancy! or holding your pinky out while sipping tea, fancy! Warm up your grill for 5-10 minutes. You want it to be in the warm/sear temperature, so the pears get grill marks quickly. Slice the pears in halves, and remove the centers using a melon baller. Once the grill is ready, placed the pear halves on the grill and let them sit for about 1-2 minutes, keep the lid open. Remove from the grill, set aside. Grab a bowl and crumble the cookies (calculate about 2 cookies per half). I used the pestle from my mortar. Now, add a little bit of the liquor and mix until absorbed. Continue adding liquor until the crumbles are moist. Be careful not to over do it with the liquor, you want crumbles not mushy cookies. If you happened to add too much liquor mix in more dry cookie crumbles. To plate: Place the halve of a pear on a dessert plate, top with the drunk cookie crumble and drizzle with honey before serving. No not leeches, just had to put it in the name because now every time I think of leche (milk) I think of leech. Don’t ask why, I really don’t know, could be because of halloween. Anywho, I can never resist this dessert when it’s available at restaurants. Well, I usually never resist any dessert when they are available at restaurants. But tres leche, cuatro leches, flans, those are my top three. I always want to try them because they always taste different as each cook has another way of making those famous desserts. What is Cuatro Leches? Have you heard of Tres Leches? Well, they are hispanic desserts. Very popular across all of Latin America. 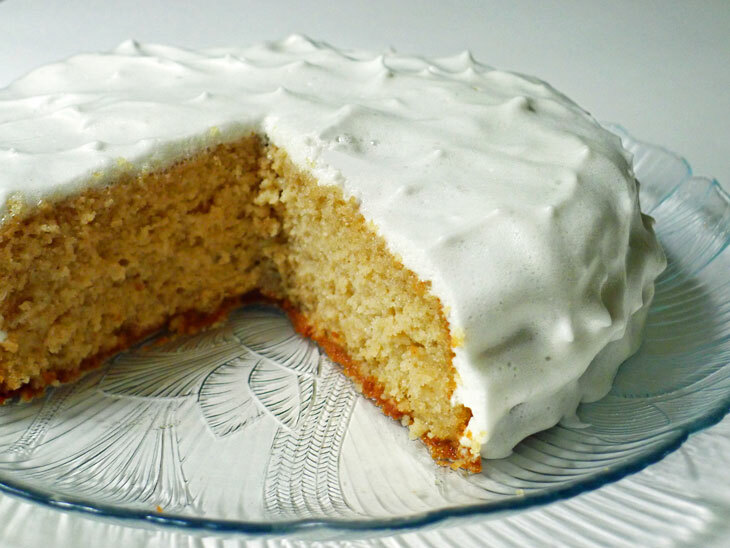 The cake is similar to a sponge cake, which is then soaked in a mixture of 3 milks. This gives the name, Tres (3) Leches (milk). For a Cuatro (4) Leches, you include Dulce De Leche (caramel) in the cake. I’ve NEVER made this cake before. Yes, I eat it any chance I get no matter who makes it. I love a Tres Leches any day. I’ve always been intimidated by this cake. It’s all about the batter, cake itself. If it’s not sponge like, it will not absorb the milks properly. And if that doesn’t happen then it’s no bueno. I was taking a risk with my Cuatro Leches, I added hazelnut creamer as one of my milks. Yes, I was nervous. I’ve never tasted a Tres Leches with this milk. It was well worth the risk, as I’m happy to report that my first Cuatro Leches was a success! AMEN. ENJOY. In your mixer, mix the sugar and butter together. Mix until creamy in texture, then add the eggs and vanilla. In a separate bowl, sift the flour and baking powder. Add one tablespoon at a time to the butter mixture until combined. Do not over mix. The batter will be thick and sticky.Spread the batter evenly on 2 greased 8 x 2″ baking pans. Bake for 30 minutes, or until golden brown and a toothpick comes out clean when entered in the center. Cool completely before soaking in the milks. Keep the cakes in the fridge while they soak. Soak for 1 hour. Now to turn this baby into a Cuatro Leches! * (I used La Lechera brand, this will be in the same aisle as condensed milk) Can’t find it? Here is how to turn condensed milk into Dulce De Leche. Remove one of the cakes from it’s soaking pan and place it in your serving dish. Now, spread some of the dulce de leche for the filling. If it’s not spreadable, heat it up a bit so it’s smooth and then try spreading. Once you have a thin layer of dulce de leche add the second cake. In your mixer, whisk the heavy cream and sugar until peaks form. Grab a pastry bag and insert a star decorating tip (I used Wilton 8B), scoop in the heavy cream. Make small stars along the rim of the top cake. Decorate about three rims. Now, grab another pastry bag and star tip, scoop in the remaining dulce de leche. Add a small rim of the dulce de leche in the center. Complete with more heavy cream stars. Serve immediately or Chill until ready to eat. Cake is best if eaten the same day, but will be good for the next day. I get to surprise you all with my creation later this month, which I’m still thinking about by the way. I gotta say that this book is so darn cute to go through. The minute I received it I quickly opened it and smiled with glee. It’s got great cheat sheets, tips, pictures for every recipe, and other little things that makes it a perfect cookbook. So after spending about 2 days just going back and forth through the book trying to figure out what shall we sink our teeth in, the Creme Brûlée was victor. It was a tough decision. I mean Lindsay didn’t stop giving us options! That girl sure can sell cookie dough. There’s candy, brownies, and custards, oh my! Then there’s pies, frozen treats, and crepes, Oh là là! This book is a must if you like to add cookie dough to things you didn’t think you could. Really it is for cookie dough addicts. I myself (get ready to gasp) had never tasted raw cookie dough, or any cookie dough for that matter, afraid of the raw egg thing ya know, until now (thanks Lindsay). Now, my other half is a cookie dough addict. So he was my jury. The minute I finished whipping up the cookie dough (which takes seconds I might add), I ran over to him for the first taste. He likes it, Mikey likes it!! Okay so his name is Alex, but you get it right, right?? He had a spoonful and then it was my turn. I tried to refrain from eating the mixing bowl because I still had to make the creme brûlée. So off to the custards I went. Wanna gasp again? This was my first time making creme brûlée as well. I’ve always been a little afraid of that recipe. Seems all fancy smancy, thought it was gonna be hell on wheels. Oh I was wrong. 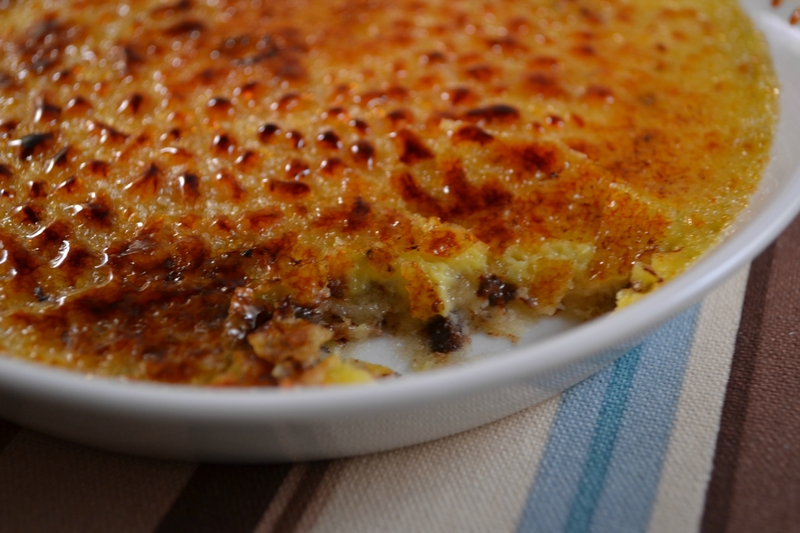 It was so easy to make, which now makes creme brûlée dangerous. Lindsay’s instructions are just perfect, and the final product… let’s just say my mouth is watering now as I think about it. I’m definelty making those beauties for a dinner party. Who’s bringing wine? Preheat the oven to 300. Grab a pot and bring about 2 cups of water to boil, this will be used as a water bath for the brûlée later. Ready for dough? Using your beater attachment, beat the butter & sugars together on medium until light and fluffy. About 2-3 minutes. Then add in the milk and vanilla. Turn it down to low speed, and add the flour and salt. Take a spoon and enjoy a taste. Now spread thin layer of 1 heaping tablespoon of the dough on the bottom of each ramekin. Press 1/2 tablespoon of chocolate chips on to the dough of each ramekin. Set aside. Custard Time! Grab a sauce pan and heat the heavy cream until it starts to steam, do not let it boil. In the meantime whisk the egg yolks and granulated sugar until light in color. About 1-2 minutes. Now, carefully pour the warmed cream, 1/4 cup at a time, whisking vigorously until incorporated. Stir in the vanilla, and skim off any foam from the mixture. Pour the foam free custard into the ramekins. In a deep baking pan arrange the ramekins, they should be spread apart with room for the water bath. Carefully pour enough boiling water unto the side of the baking pan so it fills up about halfway up the sides of the ramekins. Bake for about 20-30 minutes, until the custard is almost set. The centers should be a little jiggly. Remove them from the water bath and let them cool at room temperature. After they cool completely, cover each in plastic wrap and refrigerate at least 3 hrs or overnight. That crunchy topping Remove from the fridge, unwrap, and sprinkle 1 generous tablespoon turbinado or granulated sugar evenly over the custard. Using a kitchen torch caramelize the sugar by moving it evenly over the sugar. Torch until the sugar is melted. Serve immediately.